Union Street Players (USP) wrapped “Night of January 16th” on Sunday afternoon. The courtroom drama provided a lot of fun for audience members, especially those who had the experience of sitting on stage in the jury box and rendering their verdict each night. While there were jury members who were adamant about the guilt of Karen Andre, the verdict at all four performances was “not guilty.” Nevertheless, the twisted tale of scandal and murder provided cast, crew and audiences alike with lively conversation about the case. Many theories and unanswered questions emerged through the run of the show. Once again, USP was pleased to mix a host of stage veterans with an exciting group of actors making their debuts on the stage of the Joan Kuyper Farver Auditorium including Karl Deakyne, Vicki Hicks, Ashly Kocher, and Mark Schaefer. Cammie Nelson and Denise Gregory, who starred as Defense Attorney Stevens, were fresh from their USP debuts in “A Tinkerman Christmas Eve” this past December. 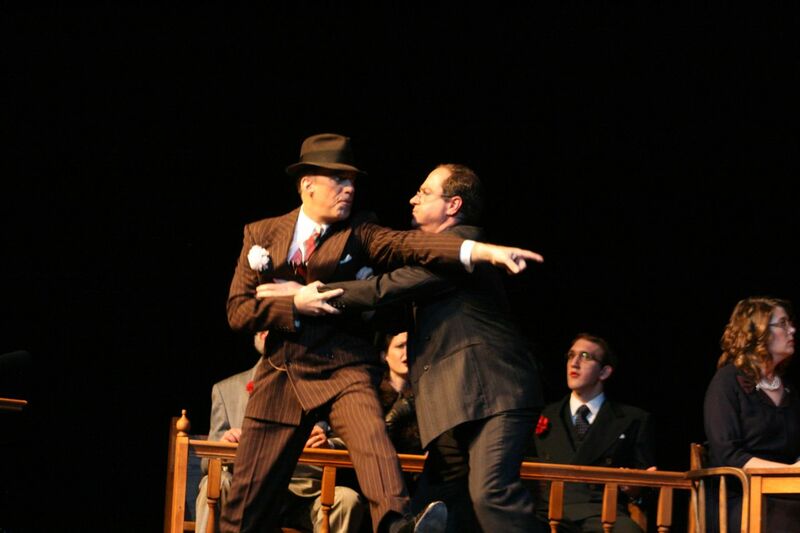 Lawrence "Guts" Regan (Tom Vander Well) makes a memorable courtroom entrance and his held back by ADA Flint (Doug DeWolf) in USP's "Night of January 16th" closing Sunday afternoon Apr 1. Union Street Players production of Ayn Rand’s “Night of January 16th” has won rave reviews from audience members in the first two performances. Great word of mouth from Thursday night’s performance resulted in ticket sales doubling for Friday night’s performance and the box office phone (641.230.1172) was ringing early on Saturday morning as ticket sales started to rise for the Saturday evening and Sunday afternoon performances. The talented cast of actors aren’t the only ones receiving the audience’s ovation. The period costumes from the 1930s designed by Pati Van Zante along with authentic period hair styles have impressed audience members who instantly feel transported into the 1930’s New York courtroom. The set, designed by Mat Kelly, has equally helped to set the stage for an authentic feeling to the trial. Audience members feel like they are in the gallery of the courtroom themselves. During the first two performances when the court bailiff (Vicki Hicks) says “All rise,” the entire audience stood! Each night a jury of audience members has rendered their verdict and decided the end of the play. For the sake of time, deliberations must be short, but the juries have engaged in spirited debate prior to the quick decision they must make. Theories on what really happened to Bjorn Faulkner are numerous and continued to be debated on stage, back stage and after the show is over. Don’t miss your opportunity to see Pella’s award-winning community theatre presenting this exciting courtroom drama! The final performances will be Saturday night March 31 at 7:00 p.m. and Sunday afternoon, April 1 at 2:00 p.m. The show is presented on the stage of the Joan Kuyper Farver auditorium in the Pella Community Center. Tickets may be purchased on-line (click here), by calling the USP Box Office at 641.230.1172, or by purchasing them at the door. “Night of January 16th” Opens Thursday! Cast and Crew of Union Street Players "Night of January 16th"
Union Street Players, Pella’s award-winning community theatre, will open our 25th Anniversary season with Ayn Rand’s classic courtroom drama “Night of January 16th” this weekend. Performances are on the stage of the Joan Kuyper Farver Auditorium in the Pella Community Center, 712 Union Street in Pella. Thursday, March 29, at 7:00 p.m.
Friday, March 30, at 7:00 p.m.
Saturday, March 31, at 7:00 p.m.
Sunday, April 1, at 2:00 p.m.
Tickets may be purchased on-line or by calling the USP Box Office (641.230.1172). $6 balcony seats all shows all times. “Night of January 16th” Opens this Week! Union Street Players opens our 25th Anniversary season this week with Ayn Rand’s “Night of January 16th.” The courtroom drama presents a sensational 1936 New York City murder trial. The three act drama provides audience members with plenty of intrigue, suspense, colorful characters and scandalous testimony. The end of the play could be different each night as twelve audience members get to be the jury at each performance. The verdict can be different each night! Doug DeWolf plays Assistant District Attorney Flint, who is prosecuting the murder case of Karen Andre (Jana DeZwarte). Andre is accused of shooting her former boss and lover and then throwing his body from the balcony of his penthouse apartment. Denise Gregory plays Andre’s defense attorney, who presents a very different explanation of the alleged events. The People of the State of New York vs. Karen Andre will be tried Thursday, Friday and Saturday night (March 29, 30, and 31) at 7:00 with an additional trial on Sunday (Apr 1) at 2:00 p.m.! Performances will be on the stage of the Joan Kuyper Farver Auditorium in the Pella Community Center. Tickets can be ordered online by clicking this link or by calling the Union Street Players Box Office at 641-230-1172. Tickets are $8 in advance for adults ($10 at the door) and $6 in advance for students ($8 at the door). Two Ways to See USP’s “Night of January 16th” FREE! Usher. We are currently looking to fill spots for ushers on Thursday (3/29), Friday (3/30) and Saturday (3/31) nights of the production. As an usher you may be helping sell tickets at the door, taking tickets at the entrance to the auditorium, or helping audience members find their seats. For volunteering their time, ushers get to stay and watch the show free of charge. Dress Rehearsal Jurors. On Monday (3/26) and Tuesday (3/27), we are looking for volunteers to be part of the jury during our final two dress rehearsals. You would need to be at the auditorium of the Pella Community Center by 7:00 p.m. on the night you choose. Spots will be filled on first come, first served basis. Email info@unionstreetplayers.com to volunteer. Please specify what you’d like to volunteer for (Usher or Dress Rehearsal Juror) and what date! Purchase Tickets for USP’s “Night of January 16th” Online! WE ARE NO LONGER SELLING TICKETS THROUGH THE PELLA COMMUNITY CENTER OFFICE! Thu Mar 29 @ 7:00 p.m.
Fri Mar 30 @ 7:00 p.m. Sat Mar 31 @ 7:00 p.m.
Sun Apr 1 @ 2:00 p.m.
(Set in the mid-1930s) Bjorn Faulkner has swindled millions of dollars from investors, investing cash he did not have in order to control the gold trade. In the wake of a crash, he is facing bankruptcy despite borrowing money from Mr. John Graham Whitfield, a prominent banker whose daughter, Nancy Lee, married Faulkner shortly after the loan. On the night of January 16th, Faulkner and Karen Andre, his secretary and lover, are in the penthouse at the top of the Faulkner Building in New York when Faulkner falls to his death. Shortly thereafter Karen Andre is accused of murdering him and is put on trial. But did she kill him? Did he commit suicide rather than face his financial troubles? Or did someone else have a motive for ending his life? Only YOU, the jury selected from our audience, can decide the fate of Karen Andre! Come witness (and maybe be a part of) the trial, shift through the evidence, and render a verdict – is Karen Andre guilty or not guilty? Serve as an Usher & See USP’s Next Show FREE! 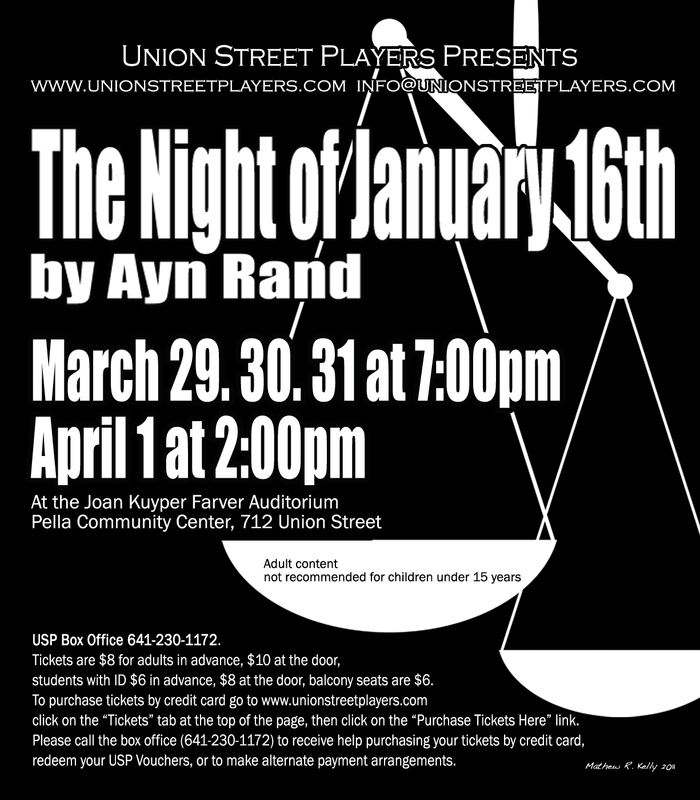 Union Street Players‘ production of Ayn Rand’s Night of January 16th will be performed March 29-April 1 (Thu, Fri, Sat, & Sunday matinee) on the stage of the Joan Kuyper Farver auditorium in the Pella Community Center. USP is seeking ushers to help sell tickets, take tickets and help patrons find their seats. Volunteers will be welcome to stay and watch the show free of charge. If interested, please contact Tom Vander Well at info@unionstreetplayers.com or call the USP Box Office 641.230.1172.